Tragedy struck this week when Naval vessel USS John McCain collided with a tanker. Several American sailors lost their lives. Rescue work has saved and salvaged all it could. But it will be a long while before investigators discover just what caused this crash. While many have theories, one possibility is raising many concerns. As well it should. The U.S. Navy’s investigation into the latest fatal collision at sea will consider the possibility of cyber intrusion. After the Arleigh Burke-class guided-missile destroyer USS John McCain collided with a tanker more than three times its size Monday, killing several American sailors, some observers raised the possibility that the U.S. warship might have been hacked. The collision follows several other maritime mishaps, including the deadly USS Fitzgerald crash two months ago. There’s something more than just human error going on,” Jeff Stutzman, chief intelligence officer at Wapack Labs and a former Navy information warfare specialist, told McClatchy. “We’ll take a look at all of that, as we did with the Fitzgerald,” he added, according to the Washington Free Beacon. 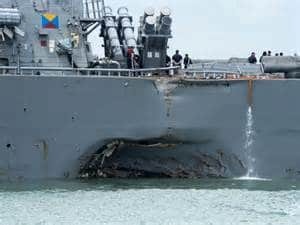 When you think about all the training and skill that goes into operating a naval vessel, it almost seems impossible that they would crash. U.S. sailors go through rigorous training; they know their ships like the back of their hand. So how could one so easily crash into a tanker, a tanker three times its size? You’d think they would have seen it appear on their instruments. Unless, of course, those instruments were tampered with. Hackers could have infiltrated the McCain’s navigational systems. With access to those systems, they could have prevented the ship from noticing the giant tanker in their path. Cyber warfare is becoming a greater concern in the 21st century. Terrorists and enemy states don’t need to command great armies to take us down. They just have to be savvy enough to undermine our own military. This might be an example of that. Hackers from some unknown location could have manipulated the McCain’s systems, as a test of what they could do. If we were entering a combat situation, God forbid a war, imagine what disaster could happen. Let’s hope the Navy can figure this out, and prevent worse from happening.